Police confirmed they have made a string of arrests in Barcelona and another in nearby Igualada as part of the ongoing probe, like reported by dailystar.co.uk. Officers are thought to be targeting a jihadist support network. Detectives stormed five properties in the Catalan capital and a sixth in Igualada, a town an hour’s drive north west of Barcelona. Up to a dozen suspects could be detained, police sources claim. The operation is being coordinated by the Audiencia Nacional – a Madrid-based central criminal court. A regional police spokesperson said: “A police counter-terrorism operation has been launched. 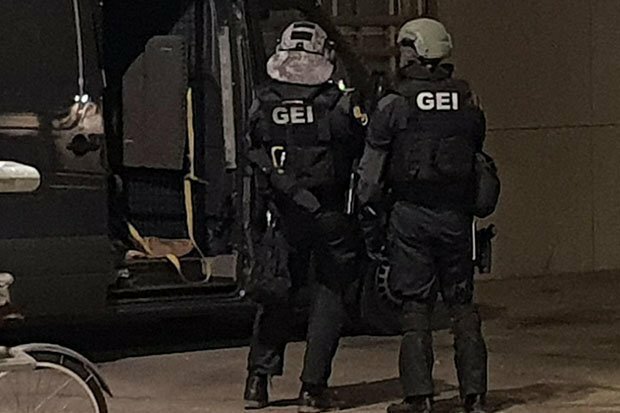 “We are carrying out six raids in Barcelona and Igualada following a lengthy operation coordinated by the Audiencia Nacional. “The operation is ongoing. More than 100 officers from different units are taking part. The jihadists, thought to be Algerian and Moroccan, are believed to be part of a terror cell that was in the infancy of planning an attack. And they allegedly stole passports and other ID from tourists to use as part of their plot, local reports claim. It comes just months after Moroccan national Younes Abouyaaqoub, 22, used a rented van to mow down and kill 15 people including British-born Julian Cadman, seven, in Barcelona’s famous Las Ramblas on August 17 last year. More than 130 people were injured in the bloodbath. Last month police in Barcelona revealed fears a Moroccan man could carry out a terror attack in the city on Christmas Day. Officers were told the Casablanca-born terrorist may try to commit a spectacular massacre in the Catalan capital using a coach or similar type of vehicle. The terror warning was highlighted by several Spanish papers on Christmas Eve who said they had seen an internal alert sent to regional Mossos d’Esquadra officers. The revelation surfaced after the US state department tweeted: “Spain. Exercise heightened caution around areas of vehicle movement including buses in the Las Ramblas area of Barcelona during Christmas and New Year. Catalan Interior Minister Miquel Buch later confirmed the existence of the terror alert. He said in a radio interview: “It’s one more of those we receive. “No doubt this case is a little different because of the US State Department tweet. “All are investigated and worked on throughly. He added: “Terrorism is a global threat and we all have to maximise security.